White Hammer Oyster (Malleus albus)The White Hammer Oyster is one of the most unusual types of marine bivalve molluscs and easily recognised by its greatly elongate hinge extensions (recalling a hammer shape) and somewhat corrugated valves. Reaching a shell length of 200mm, it lives on the surface of sandy-mud bottoms in intertidal and shallow subtidal areas (to 5-10m), often partly encrusted with marine growths. Large specimens are usually loose, but juveniles are anchored by byssal threads to rocks and/or dead shells. Internally the shell valves exhibit a nacreous (pearly) appearance. 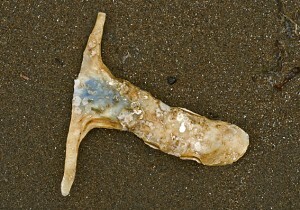 The closely related species, the Black Hammer Oyster (Malleus malleus) has a much darker shell than the White Hammer Oyster, but sometimes occurs in the same localities.